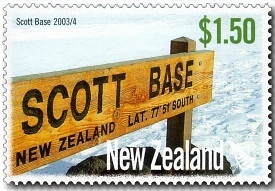 Virtual New Zealand Stamps: 2007 50th Anniversary Scott Base. 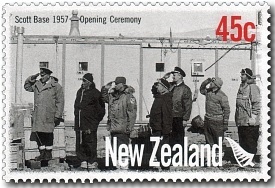 Officially opened on 20 January 1957, Scott Base is New Zealand’s permanent research support station in Antarctica. It was originally designed to last just a year or two, but its enormous value as a centre for scientific research has seen it grow and flourish. 45c - Scott Base - 1957 Opening Ceremony. Scott Base was designed, built, transported to and established in Antarctica within just 10 months, an astonishing feat given the logistics of the project and the climatic and operational conditions the building was required to withstand. However, the deadline had been set by Prime Minister Sidney Holland, who had committed New Zealand’s support to the 1957 Trans-Antarctic Expedition (TAE) and the 1957-58 International Geophysical Year (IGY). 90c - Scott Base - 1990. 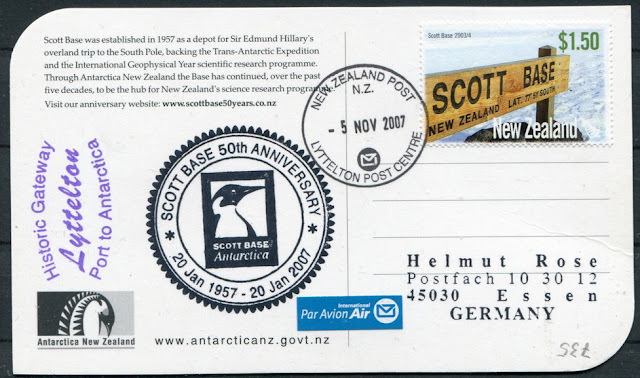 Scott Base – named after the great explorer Sir Robert Falcon Scott – became a permanent New Zealand station in 1962, maintained by the New Zealand Antarctic Research Programme under the auspices of the (then) Department of Scientific and Industrial Research (DSIR). Since then, it has undergone a number of major redevelopment programmes, with new science facilities, equipment and accommodation blocks. 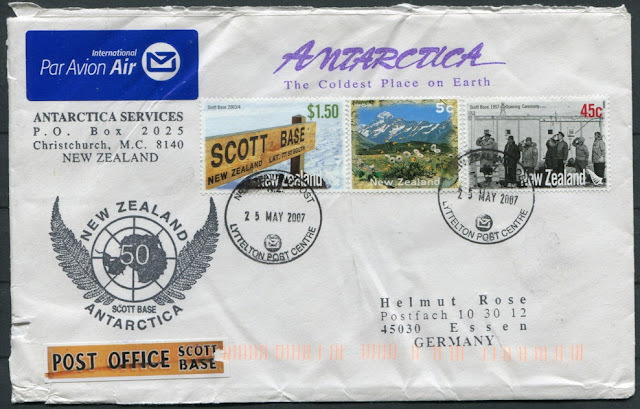 $1.35 - Scott Base - 2000. Of the original six Scott Base buildings, only three remain – the G and Y huts, and the A Hut, which in 2001 was renamed the TAE/IGY Hut to recognise its original purpose and to reflect its importance as the social and political hub for the two events. Today, the Hut is preserved as a historic monument and provides a quiet haven for Scott Base staff taking a break from communal base living. 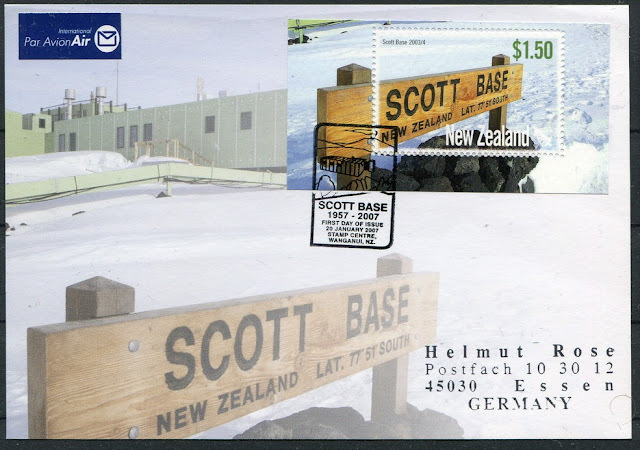 $1.50 - Scott Base - 2003 / 04. 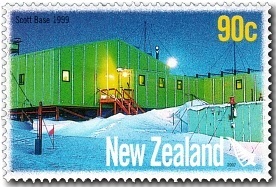 Once a mixture of orange, red and yellow buildings, Scott Base is now a uniform green – a decision made in 1976 by the Director of DSIR’s Antarctic Division, Robert Baden Thomson. He suggested it would reflect the colours of New Zealand’s pasture and bush, but rumour has it that it reminded him of a trip to Ireland. Today, the colour is referred to as RBT Green, although it’s actually ‘Chelsea cucumber’! 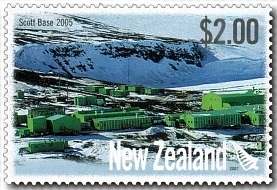 $2.00 - Scott Base - 2005. Scott Base’s first 50 years have been a remarkable period in history. Tens of thousands of science days have been spent on and around Ross Island and the Ross Sea region, and around 10,000 people have visited the Base since it opened. Its facilities have also continued to improve, with the latest being the Hillary Field Centre – a heated all-weather storage facility named after Sir Edmund Hillary, which was commissioned in 2005. 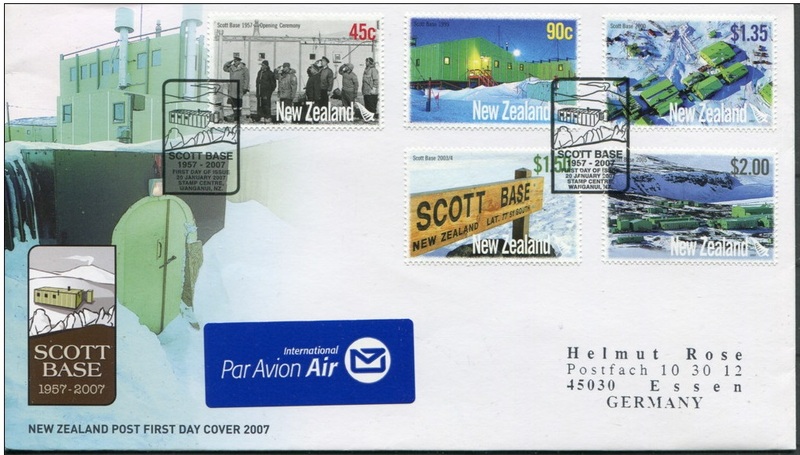 The official NZ Post First Day Cover. Notice the special Scott Base cancel produced for the anniversary. The cover appears to be missing a date showing that it is, in fact, a FDC. The only date shown is in the fine print of the official cancel that was only used on the 20th January 2007. This First Day Cover shows a more readable example the office cancel. You can see the date 20th January here. It also features the $1.50 value in its special miniature sheet. 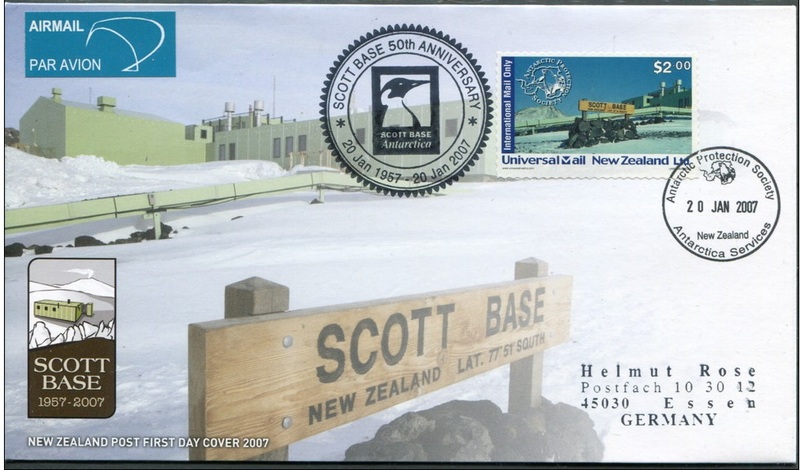 First Day Cover by local post, Universal Mail New Zealand Ltd. Notice the round Scott Base Anniversary cancel. A post card to Germany much later in 2007. 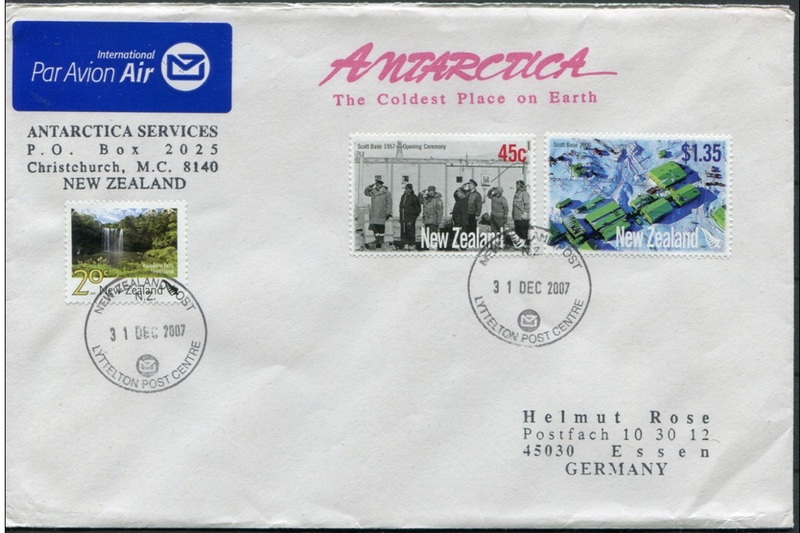 Two covers from Antarctica Services based in Christchurch. The covers show two 2007 Scott Base stamps plus one from the scenic definitive series. They appear to have been posted in Lyttelton and not been to Scott Base. 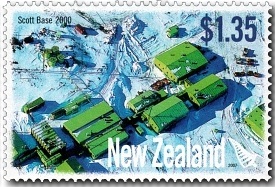 These stamps, being general New Zealand issue were available for use throughout New Zealand. Here is the set of miniature sheets with each stamp being featured on its own sheet. I would like to get larger images of these if I can. These stamps remained on sale until 19 January 2008.